Not so long back, diamonds were considered jewels which only the rich could afford and wear. That has changed, and how! These days, diamonds have become much more affordable and a must in every woman’s wardrobe. Today, the leading jewelers have collections for weddings, day to day wear, office wear and even to woo the teenagers, with designs and budgets to satisfy everyone. It is safe to say that diamonds have slowly but surely crept into the households and enjoys the same status, if not more, that was once enjoyed by gold! However, unlike gold, diamonds make a very versatile piece of jewelery as rarely do they look over the top and gaudy and hence can be teamed with almost every outfit in your wardrobe. While shopping for a diamond, most of us go by how much are we willing to spend, or our budget. Quality of diamond is known by its 4 Cs – cut (shape of the diamond), clarity (how well can it reflect the light and hence shine), color (purest being white, with impurities color starts getting yellower) and carat (size of the diamond, bigger the diamond, higher the carat). These 4 Cs determine the price of diamond jewelery. Diamonds come in a variety of shapes – round being the most common and being used the maximum in all kinds of diamond jewelery. The second most popular shape is the princess cut, or square pieces of diamonds with pointed edges. These are very commonly used in engagement rings and solitaire ear rings. Diamonds which are slightly longer than wider and have unique multi-dimensional cuts ( similar to an octagon) at the corners to give an optical illusion and reflect light beautifully are known as emerald cut, and are also popularly known as baguettes. These make great ear rings, rings and even necklaces. When the cut remains the same as the emerald, however the length and the width are the same, giving a square appearance the shape is known as Asscher. We all know what a heart shape diamond is – which is immensely popular to be gifted as expressions of love – an engagement ring or a pendant on your first anniversary together. Pear shaped diamonds are like an inverted tear drop and look great in ear rings. Oval shaped diamonds shine brilliantly, just as the round shape diamonds. Their length accentuates the length of the fingers, making them look even more slender and long. Marquise shaped diamonds are like boat shaped, pointed at the edges and elliptical. Owing to their shape, they create an impression of a much larger diamond than the actual size and look great when mounted atop platinum prongs of a ring. Budget notwithstanding, we would like to know the various kinds of diamond jewelery that are must haves in our wardrobe and how to team these with our dresses. I divide this section into absolute must haves, consider these as staple / basic pieces of diamond jewelery that you should positively own; and then aspirational pieces of jewelery or something that you would like to own and pass on as heirlooms to your future generations or maybe reward yourself with on, reaching the milestones set by your own self in your life – a promotion you have worked very hard for, reaching your desired weight….the list could be endless! These would be the designs that you in all probability already own, or are working towards owning them and would wear them for your day to day routine. Ear rings could be for regular use at the college / office or at home. A lot of floral and geometric patterns are available in the market. Choose ones which appeal to you. Small diamond studs, small rings coated with diamond dust are other common yet timeless styles, which look great and are very versatile as they could be teamed with Indian as well as western wear, formal as well as informal wear. These look good on working and elderly women, who want to have a dignified look about them. Fun shapes, usually with a small diamond such as those based on the theme of astronomy – the sun, moon, stars and animals such as rabbits, dolphins or the nautical – anchor, the wheel etc. look great on younger girls and teenagers as they seem to be making a statement of their own by wearing these. Ear rings in diamonds for every day wear are normally not long as these may interfere with your work and may garner unwanted attention. Simple gold bracelets with a small design in diamond look great when you want to spend time out with your girl friends at a pub, or watching a movie. 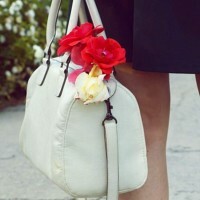 Without being too much in the face, these look chic and can be worn at the office too. Choose from diamonds studded at the front of the bracelet in a unique floral, vines, geometrical pattern or simple well fitted bangles with diamond dust strewn all over. The beauty of the bracelets lies when they fit well, resting just where the diamond encrusted pattern sits across the wrist; choose elliptical shapes of bracelets to achieve this as our wrists are more elliptical than perfect rounds. You could have a couple of these in different interesting designs, and could change and wear them to add spice to your mundane office wear. Yes, the added advantage of wearing diamond encrusted bracelets is that you could wear them as single pieces and could choose to team these with western as well as Indian wear, formal as well as informal wear. Simple chains in gold, platinum or even rhodium covered silver with diamond pendants look great with any outfit. The diamond pendant could be all diamond or a mix of gold / silver / platinum with some small diamonds thrown in. Again the choice of design is limitless, considering there are designs to suit every taste, from floral patterns, to birth signs, abstracts and even pendants with religious symbols such as the Om, the Cross and replicas of the Gods. You could have different styles of pendants and don them as per your mood, a heart shaped diamond pendant when you go out with your boyfriend, a nice floral or a geometric pattern when you go to meet your prospective in laws, a cross when you visit the church etc – you get the picture! It could be a great idea to select a few pendants and hang them as charms on your bracelets as well to have a unique style statement. Try to follow a theme though such as nautical, floral etc. in order not to look too cluttered. 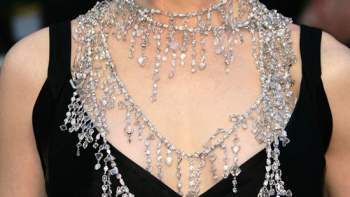 Other neck pieces could include mangalsutras (a neck chain having black beads worn by married women in India, as a symbol of their wedding) which have an elaborate center piece made in diamonds. These could be sitting really close to your neck or could be at the end of a long chain. To show off your well manicured hands, no other piece of jewelery looks as great as the humble ring. Price range of rings could be a few hundreds and could go up to where you can imagine. 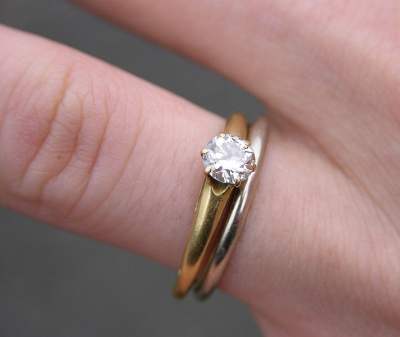 Statistics tells us that diamond rings are the most popular items that are sold / bought the world over. Choose every day designs for workplace, college and other day to day activities, which look great, add subtly to your whole persona, without actually diverting the attention from you to your rings. A host of options are available, choose ones which are classics and could go well with almost all your outfits. It is common to have rings in different designs in your wardrobe. 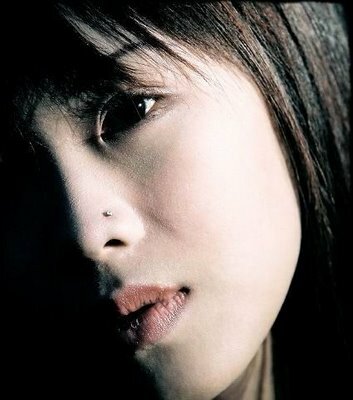 If you have your nose pierced, choose small diamond studs in different shapes and sizes to don. They look great when they shine and lend the face with a sheen very few items can match. You could choose from a small floral pattern made with really small pieces of diamonds or small solitaire studs and even a star. Like with other diamond jewelery items, imagination is the only thing you need when you go out shopping. Richard Bach said about wishes and I quote “You are never given a wish without also being given the power to make it come true. You may have to work for it, however.” What’s a life if you do not have wishes? And what’s a wish if you do not want to work towards it to make it a reality! This section talks about the trendy pieces of diamond jewelery all of us “wish” to have in our wardrobes. You could have seen an item of jewelery worn by your boss, or worn by a social butterfly, a movie actress or your friend have dreamt of possessing something similar. Well, impossible is nothing! Set a goal on what you want, try and save up for it; better still, work towards rewarding yourself with this item of jewelery and see how your wishes come true! Big hooplas studded with diamonds, chandelier ear rings, ear rings with diamonds and rubies, tear drop diamond ear rings and the good old, yet classic solitaires all could be a part of your wish list. All the styles listed here are classics and could easily be a part of something that you would want to pass on as heirloom. Choose one you feel most drawn to! More elaborate designs, with bigger diamonds replacing smaller sized diamonds and diamond dust as discussed above will fall in this list. Again, choose wisely. Owing to the huge amount of money, you will end up spending, it is best to go in for classics rather than some fad style, which may go out of fashion after a few years. Ever fancied wearing a ring, the size of a rock( okay, to give you a clearer picture, I am talking about the solitaire rings donned and made immensely popular by our very own film stars – Sushmita Sen, Jennifer Lopez and the likes)? If bling is the key word, the bigger the size of the diamond in your ring, the better it is! Go ahead and choose from the many designs available in the market. Sets would consist of a diamond necklace and matching ear rings. If you wish to go in for an evening party wear, choose floral designs in different cuts of the diamonds that are available in the market. Elaborate sets of diamonds paired with other precious jewels make for a great wear especially for weddings. These days, brides team up their diamond sets based on the color of the wedding dress as well. Choose one which looks great with any traditional outfit when buying a set, as these would mostly be worn with dresses and gowns. String of solitaires worn at the neck also looks super cool and can be teamed with western as well as Indian wear. Watches studded with diamonds are the new style statement for the uber chic woman. 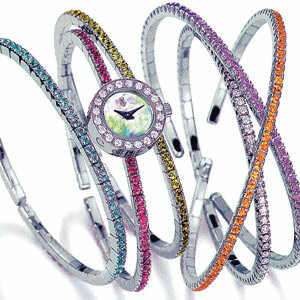 The choice in watches made with precious metals and studded with diamonds is vast. Do refer to our separate article, where this has been covered in more details. Diamonds lend an air of sophistication and elegance very few other jewels can lend. They easily reflect on your beauty, wealth and are a timeless expression of love. Stock up on your diamonds, it would be a good idea to buy a few classics and a few spunky designs to complete your work and day to day wardrobe. For the more special occasions, choose solitaires or other classic pieces which can be worn with any attire and lend a charisma and aura to you! Opt for certified diamonds, after all you do not wish to end up spending on diamonds which may be of spurious quality! Also, do not forget to care for them. Caring for your diamonds goes a long way in ensuring that these last you a life time and more and do read up on our separate article on caring for your diamonds.